You can chart dental conditions present at the time of charting in a patient's clinical chart. Note: A condition charted in the clinical chart appears only on the graphical tooth chart and in the progress notes, not in the financial ledger. On the Chart tab of a patient's clinical record, select one or more teeth. Click (or tap) Add Condition to select the appropriate condition, surfaces (if applicable), and provider in the Add Condition dialog box. Make sure the correct provider is selected for this charting session. Click (or tap) a condition. Note: The conditions that appear in the list depend on which teeth or if no teeth are selected. For example, if no teeth are selected (the treatment area is the mouth), a missing tooth condition will not appear in the list of conditions because it can apply only to one or more teeth, but malocclusion options can appear because they apply to the whole mouth. 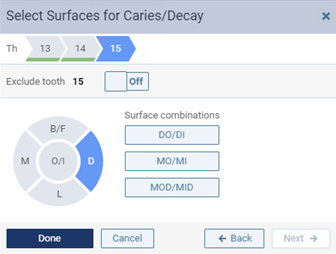 If applicable, in the Select Surfaces dialog box that appears, select the surfaces on each tooth for the selected condition, and then click (or tap) Done. To navigate between teeth, click (or tap) a Th. Alternatively, click (or tap) Back and Next. To not enter surfaces for the selected tooth, set Exclude tooth to On. To apply a common combination of surfaces, under Surface combinations, click (or tap) the appropriate button. Tip: To treatment plan a condition that has been charted, on the Progress Notes tab of the patient's clinical record, click (or tap) Treat for that condition. I do not see how one can chart a class 5 caries. Am I missi something? You are not missing anything. The program apparently is. I will submit this feature request for you. 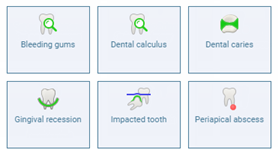 I was trying to chart the remaining root tip on a tooth , but there is not such icon to choose, so what can i do? If you do not see the icon in the Add Procedure area of the Chart, you can type the name of the procedure in the Procedure Search area at the top right. Typing in residual will bring up the choice of Removal of Residual Tooth Roots D7250.